Summary: A very satisfactory set of record figures from this lighting specialist, underpinned by last year’s Dutch acquisition that appears to have delivered 75% annualised profit growth. TFW’s other two divisions reported positive progress, too, while the balance sheet remains awash with surplus cash and investments. Although the near-term valuation appears rich, the group’s decent financials, illustrious dividend and veteran board remain very captivating. I continue to hold. Excluding the contribution from last year’s Dutch acquisition, 2016 revenue gained 4% to £73.4m while operating profit advanced 6% to £14.1m. That rate of expansion essentially matched the 5% underlying growth reported during the first half. The performance of the acquisition, however, was the statement’s highlight. 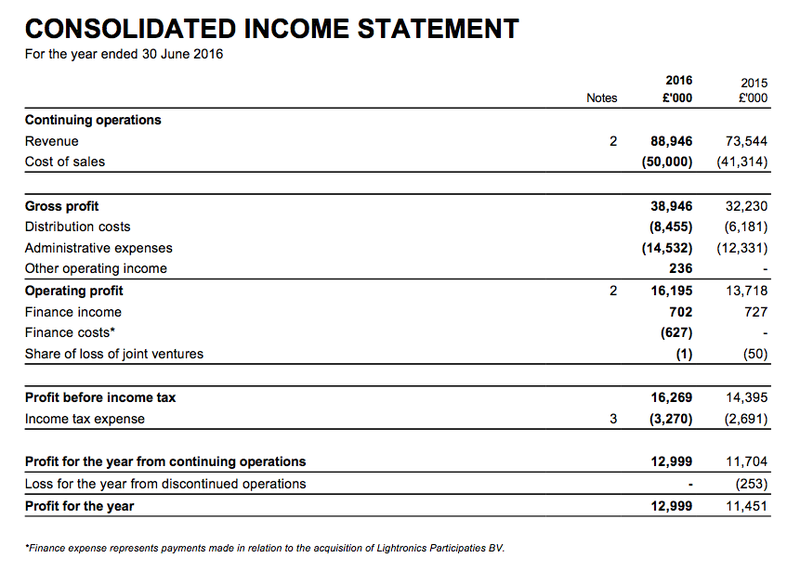 Purchased during April 2015 for an initial £6m, Dutch outdoor-lighting specialist Lightronics had reported revenue of £10.9m and an operating profit of £1.2m for 2015 (during which TFW owned Lightronics for three months). These 2016 results, however, showed Lightronics delivering revenue of £15.5m and an operating profit of £2.1m. Lightronics was rather modestly described by TFW as having “performed very well” following the 42% revenue leap and 75% profit surge. 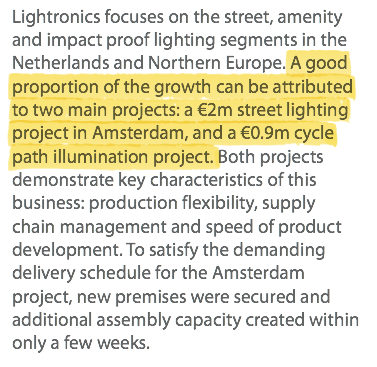 I noted within TFW’s interim results that the Dutch subsidiary’s performance had been helped by some “one-off projects”, but even so its achievement for the full year was superb. I calculate these annual results would have shown underlying revenue up 10% and underlying operating profit up 12% had Lightronics been owned throughout the last two years. 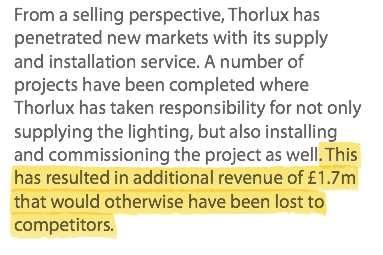 This latest statement acknowledged Thorlux’s annual revenue was flat, in part due to the loss of “regular business” worth £1m. Nonetheless, Thorlux’s H2 profit did creep higher as the subsidiary enjoyed greater LED-related business and reduced “inefficiencies” following fewer orders for “traditional” lighting. The reduced “inefficiencies” allowed Thorlux’s full-year operating margin to return to a splendid 20%-plus. Meanwhile, TFW’s ‘Other’ companies — representing six smaller lighting operations — managed to lift their collective 2016 profit by 13%. Sadly there was no repeat of the 2p per share/£2.3m special dividend witnessed at the interim stage — although TFW could have easily afforded to repeat such a payment. Adding on TFW’s various other surplus financial assets, and then subtracting the outstanding Lightronics earn-out, the overall net cash and investment position comes to £39m (34p per share) — equivalent to three times this year’s £13m earnings. The full-year ordinary dividend was raised 11% to 4.05p per share — and was covered a sizeable 2.8 times by earnings. I calculate the dividend has now been lifted for 14 consecutive years, during which time four special dividends have also been paid. However, both ratios have reduced over time due to the aforementioned “inefficiencies” at Thorlux and the acquired intangibles associated with the purchase of Lightronics and another lower-margin subsidiary. Using the 2016 operating profit of £16m and applying tax at the 20% seen in this annual statement, earnings are about £12.8m or 11.0p per share. Then adjusting the present £278m market cap (at 240p) for the group’s net cash, investments and the Lightronics earn-out, I come to an enterprise value (EV) of £238m or 206p per share. Dividing that 206p per share EV figure by my 11.0p earnings guess gives me a trailing P/E of 19. I suppose that upbeat multiple is understandable given the recent performance of Lightronics and the chance this particular division could help deliver double-digit growth for the wider group in the coming year. TFW’s veteran management is “cautiously optimistic” about the near term, too, which is about as positive as the cagey board ever gets. I trust this management outlook bodes well for shareholders. Meanwhile, nobody will become rich from the stingy 4.05p per share dividend, which translates into a 1.7% income at 240p. Great update as always on a company that I bought on your MF recommendation, knowing nowt about it, in May 2010. Since then I feel I’ve come to know TFW rather well and despite the “stingy” dividend, having just looked at the share price graph from that date – I owe a big thank you! Recent share price performance of TSTL, bought June 15, has also been pretty strong though I noticed you top sliced a while back on management transparency worries. Do you still feel that way or will the Australian Distributor and new product sales continue to drive growth and outweigh that? I am glad you have done well with TFW. I still harbour doubts about TSTL management and believe the execs pulled one over on shareholders with their 134p options and the (lack of) disclosure at December’s AGM. I still hold TSTL shares as the product quality is attractive. The real shame is that the business appears to have recovered since the February interims. Given where the share price has traded recently, it will only be another 2-3 weeks before those 134p options would have vested and nobody would have complained. Management could have been heroes now had they been totally upfront at the AGM. This type of income broadens the division’s abilities and could be a useful money-spinner. I’d have thought it would make sense for customers to appoint Thorlux as the installer of its own lights — as Thorlux naturally knows most about them. €2.9m equates to £2.2m at £1:€1.3 — my guess at the approximate exchange rate during the financial year. Those two projects represented 14% of the revenue from Lightronics. Excluding these projects, Lightronics’ revenue would have still advanced 22% from £10.9m to £13.3m. Individual executive wages advanced between 2% and 12%. Bonuses remain under control, too. Monthly average staff numbers increased 8% from 547 to 591 — yet revenue climbed 21% from £73.5m to £88.9m. Revenue per head was £151k last year, compared to £134k for 2015, between £112k and £119k for 2010-2014, and sub-£100k pre-2010. Certainly TFW has made credible progress with employee/revenue productivity, which I believe has been underlined by the improving quality of the firm’s products and its ability to charge customers accordingly. Revenue per head of £151k is high and impressive, and clearly the Lightronics deal has had an effect on TFW’s overall progress in this regard. The management narrative in this annual report refers to 51 Lightronics employees, which equates to divisional revenue per head at a wonderful £304k each with this subsidiary earning revenue of £15.5m. These numbers add to the notion that this Lightronics deal really was a clever purchase. Also, total staff costs as a percentage of total revenue was 26.7% for 2016 — the lowest percentage since at least 2004. Freehold book value is £9m. I seem to recall that the group’s largest site was purchased more than 25 years ago. TFW continues to report a small pension surplus within its defined-benefit scheme. With plan assets of £35.5m and assuming no major reduction to contributions, I don’t envisage any immediate funding problems should paid benefits remain at just above the £1m level. “The current year’s trading has started in a pleasing manner for most Group companies with Thorlux being particularly busy at this time when there is normally a reducing work load heading towards Christmas. Whilst we are relatively confident of the higher order book level continuing, the financial year can be like the proverbial game of football, a period of two halves, and with Brexit, fluctuating currencies and “The Donald” factor we must keep our fingers crossed for the second half.